"Wahhabism, a messianic radicalism that arose in the 18th century, hopes to restore a fantasized caliphate centered on a desert, a sacred book, and two holy sites, Mecca and Medina. Born in massacre and blood, it manifests itself in a surreal relationship with women, a prohibition against non-Muslims treading on sacred territory, and ferocious religious laws. That translates into an obsessive hatred of imagery and representation and therefore art, but also of the body, nakedness and freedom. Saudi Arabia is a Daesh that has made it. - The West’s denial regarding Saudi Arabia is striking: It salutes the theocracy as its ally but pretends not to notice that it is the world’s chief ideological sponsor of Islamist culture. The younger generations of radicals in the so-called Arab world were not born jihadists. They were suckled in the bosom of Fatwa Valley, a kind of Islamist Vatican with a vast industry that produces theologians, religious laws, books, and aggressive editorial policies and media campaigns. (..) There are thousands of Islamist newspapers and clergies that impose a unitary vision of the world, tradition and clothing on the public space, on the wording of the government’s laws and on the rituals of a society they deem to be contaminated. - It is worth reading certain Islamist newspapers to see their reactions to the attacks in Paris. The West is cast as a land of “infidels”." 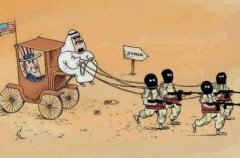 NATO Nations Involvement/Backing Saudi Arabia & ISIS Middle East. While saying they fight ISIS, they actually fund, arm, protect & bomb for ISIS (HS links below). 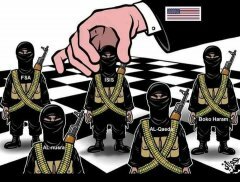 The So-called ISIS terror in the West could be a Gladio 2 to give NATO reason to 'interfere' in the Middle East. HS NATO's Phoenix - HS NATO's Criminal Policy - HS ISIS is NATO - . "In The Great Theft, Khaled Abou El Fadl, one of the world's preeminent Islamic scholars, argues that Islam is currently passing through a transformative period no less dramatic than the movements that swept through Europe during the Reformation. At this critical juncture there are two completely opposed worldviews within Islam competing to define this great world religion. The stakes have never been higher, and the future of the Muslim world hangs in the balance.